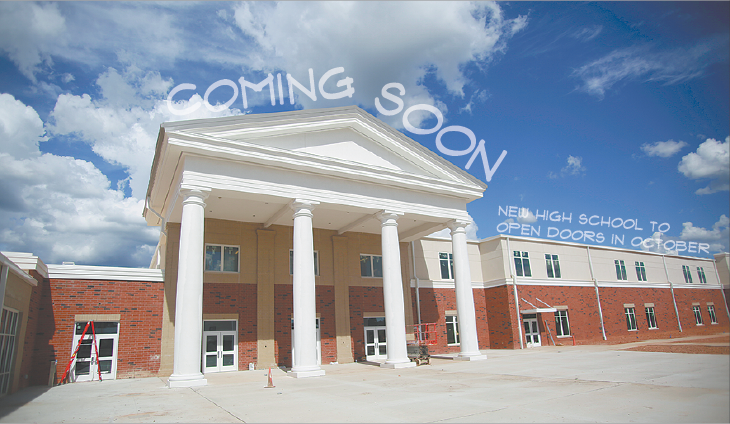 Students will return from Fall Break to a brand new high school this October. Construction for the new high school, part of a $55 million new consolidated campus project, is in its final month and moving as planned. “Every day walking in, there’s always something new,” CTAE Director Jennifer Butler stated as she led members of the high school faculty and Board of Education around the rapidly developing building Monday. The high school is expected to be complete and prepared to function for student attendance on October 16. Much of the building’s construction accommodates the high school’s college and career academy programs. Students can expect a complete Biotechnology lab with an adjoining aquaponics set up, a Mechatronics Engineering lab to support the program’s expansion, a school store with a large store-front window for the Marketing program, a “google room” for team projects connected to the library, a hands-on culinary lab attached to the cafeteria’s food services section, and more. The Daily Living space for students with special needs will consist of a classroom, a pull-out room, a living space for them to learn everyday tasks, and convenient access to both the Main Street and bus entrances. The Airforce/JROTC suite will include a firing range for their air rifles. The two-story building will possess enhancements of traditional features as well. A counseling suite will be located near the cafeteria for students’ convenience and a nurse’s office will be constructed as well. The Fine Arts auditorium will take on a more sophisticated look and hold 521 seats. “It’s been amazing to see it actually being built from a dream to actuality,” Butler said. According to Woodard, the school has raised $886,000 of their $1.5 million 2019 goal.